Atlanta pianist vocalist Jim Tiernan has withstood the test of time having spent the bulk of his adult life in Atlanta, Ga. Since the 1970’s to today, Tiernan has held together a most sought-after one nighter Atlanta music wedding band known locally as “Blue Sky”. 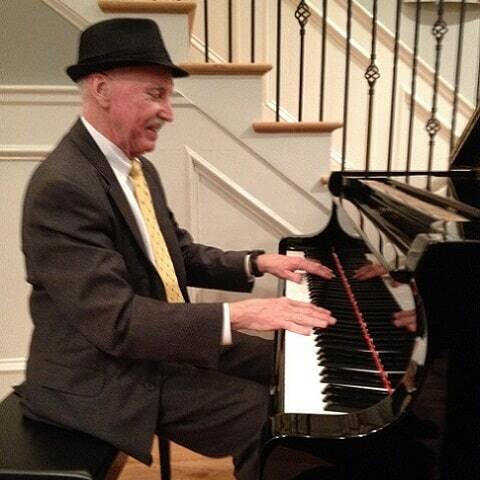 When not performing with the popular Blue Sky band, one is likely to find Jim performing solo piano privately throughout Atlanta’s area country clubs and event facilities. “Live performing – no matter if it is solo or with my band – is what I love to do most of all!” he says. In the early 1980’s Jim was hired on as one of the house pianist vocalists at the then nationally known piano bar restaurant, Carbo’s Café. He performed there one or two nights a week for 15 years! His repertoire in those years grew by leaps and bounds. Music that he holds dear is the most favorited, beloved American songs of all time. Jim reads his audience demographic like a seasoned NFL quarterback reads his opponent’s defense. Because Tiernan has memorized so much “cover” music, he can change the mood and tempo of any event on a dime. Jim is still living the dream – doing what one loves to do and getting paid for it! He is the consummate entertainer coupling sophisticated charm with nearly peerless talent at the keyboard. Before you hire this Brookhaven pianist know also that he wears another hat. He owns Blue Sky Atlanta Music & Entertainment! Jim says, “I have always considered myself a promoter of exceptional musical talent. My agency represents some of the finest bands, musicians, magicians and DJs in the country. I receive as much pleasure representing a gifted violinist or a harpist as much as I do preforming myself. It is the satisfaction of my customers that I have always been the most concerned about. We will give you musical concierge service. Because you deserve the best for your corporate or social event and by booking the best, you are going to be happy with it! …take it to the bank! Quote: Call Today (678) 467-8263 for the Best Quote in the city! New Songs are added frequently and upon request especially for our Brides who want a new or special song not listed above! was absolutely amazing. He was prepared and even took the time to learn songs that were special to me from Little Women and Anne of Green Gables. The ceremony was absolutely magical because of the piano component. I have used Blue Sky Atlanta often through my position at Cherokee Town and Country Club and I can always count on them to produce amazing talent for any event. I highly recommend them for weddings or any type of special event. Hi Jim and Happy Holidays to you! Thanks for performing piano for our 12/18/16 wedding reception. Our January 27th, 2017 private party is at 103 West in Atlanta, GA. Timing is 5:30-8:30pm or 9:00pm. So, just let me know what you need from me for that party. Thanks for making our reception so special and fun! Loved your piano playing! ? We heard you were really wonderful on the ivory keys, and really wished we could listen to you in person! Thank you again for making our guests’ experience during our cocktail hour more memorable! We hope to cross paths again soon! You and Blue Sky did a great job at the Hellenic Center for our wedding. Everyone had a wonderful time. My husband and I were very pleased with everything. Thank you. Thanks so much for making our party fabulous! The band was great, super, extraordinary etc. etc.!!! Everyone had a great time and I hold you responsible! My feet let me know the next day that I had on my dancing shoes. Take care and hope we can do it at least once more in this lifetime. If you ever need a reference let me know. p.s. I just wanted to add my 2 cents and tell you that Blue Sky was Awesome Friday night June 5, 2009 at the Chastain Horse Park, but you could tell by there never being room on the dance floor. All of our friends talked about the music so we hope you get some future dates from it , you deserve it. Married life has been great. I cannot believe it has been two and a half months already! Time flew and we had tons to do after the wedding! We could not have been happier with the level of service and wonderful performance you all gave. It was exactly what we wanted and we have had many comments about how wonderful you all were. Thank you so much for giving our wedding the atmosphere we dreamed of! Can’t wait to hear you again at our friend’s wedding in September! Thank you! You and the Blue Sky Band did a wonderful job at our wedding reception at the Atlanta National Golf Club on Saturday November 1, 2008.. I know our guests had a great time. We’ve received a lot of compliments about your performance and how much everyone enjoyed themselves. Even my dad, for the short time he was able to attend the reception, enjoyed your performance, which is always a tough sell because he’s a professional musician! So glad you guys had a good time as well! You definitely earned my recommendation. You haven’t lost your touch! The music for my daughter’s wedding on the 31st of August, 2008 was wonderful! Your band played such a diverse repertoire and you exceeded my expectations. Because you kept the energy level high, the dance floor was packed all night. I was surprised to see so many people dancing throughout the evening, which is a credit to Blue Sky’s wonderful skills. The Naylor Hall package includes a D.J. but they don’t know what they are missing. It was so nice to have you host the reception as the touch of class would be missing if you were not there. When I had used your services in the past, I never thought I would be in a position to need a band again. I am just thrilled and hope another occasion will arrive in the future when I call on you again. You are terrific! Thanks you so much for helping to make our wedding day such a blast! You and your band “Blue Sky” are truly a talented bunch and we had the time of our lives dancing to your MUSIC! Our guests kept telling us what a great time they had. Many have told us they had the best time they’ve ever had at a wedding! We will be sure to recommend you to anyone we know who’s looking for some great entertainment. I wanted to THANK YOU again for such a wonderful performance last Friday for our Atlanta Braves’ Hall of Fame Luncheon at Turner Field’s 755 Club. I have heard nothing but great reviews about your fantastic tunes. It really was a great addition to make our luncheon first class this year. I will let you know if anything comes up in the future and Im of course recommending you to those that are looking for a first class pianist. Thank you for providing The Blue Sky Band, the perfect music for our daughter’s wedding celebration at the Ritz-Carlton on Saturday June 10, 2006. Normally, most of my friends are very quiet and don’t dance, but your band had everyone on the dance floor the whole night. Your music appealed to all ages – from the 5-year-old flower girl to the oldest guests in their 70′s. I have had phone calls and emails from my friends telling me that they have never had so much fun on the dance floor. I hope you will be hearing from some friends who got your card because they want to talk with you about playing at one of their fund raisers in Cashiers, North Carolina. Thank you for adding so much to the evening. It was amazing. Lauren and I would like to thank you and your band for an amazing performance and helping to make our reception so much fun for everyone, young and old alike. You were so gracious and accommodating in letting my sister Gayle sing with your band. You did a great job at keeping everyone entertained and the quality was top notch. I would recommend your band to anyone, you were the perfect choice for our reception. Thanks again for everything! Aloha from Hawaii! I would like to thank you so much for playing at our wedding reception and for everything that you and your band, Blue Sky, did to help make our day so special. We received so many compliments about the band. you guys are great! Just a quick note to tell you once again how much the crowd enjoyed your performance with your band Blue Sky on Friday September 17, 2004. You really hit the nail on the head with your song selections. And if it weren’t for this group’s hip replacements, bum knees, heart problems, etc., the dance floor would have been PACKED. I just wanted to send you a huge Thank You for making our wedding so much fun. It was everything I ever dreamed and mostly because of you and your band!!! Everyone was asking me about you all so hopefully you’ll be playing at some of my friends weddings in the future! Thank you again for everything, you all are awesome!! It was perfect!! Thanks for playing February 22 at the 2003 Gwinnett Heart Ball at the Gwinnett Civic Center and for your important part in making it a success. The attendees loved your band, BLUE SKY, and enjoyed dancing to your music. Do you play at any clubs in Atlanta? We’d love the opportunity to hear you again. Well, we really appreciated your wonderful band playing at the auction at Providence this year. You were great as usual. I also would really appreciate some information about the band you were telling me about that is sort of the “big band” kind of band. Almost a month has passed since our wedding and Don & I are still savoring the memories of that day. We want to thank you and “Blue Sky” for providing the perfect music for the occasion – from your piano solo to the dance music and your vocals – it was just what we had envisioned for our celebration. Also, there were many compliments from our guests! We will be happy to recommend you and your company, Blue Sky Atlanta to others! I wanted to write and thank you for making Megan and Seth’s reception such a wonderful time. Jen, I thoroughly enjoyed working with you. You were so accessible and had all the answers for a first time ‘mother of the bride’. Jim, the music was great. You and your band were the height of professionalism. The combination of your band and the DJ was exactly what Megan and Seth were looking for. The UGA ‘tribute’ was such fun. I know all the alumni got a kick out of it. Once again, thank you for making Megan’s special day all the more memorable. And since I have two more daughters, we will be calling you again!! You and your band were perfect for our wedding reception at Studio Two. Remember my only requirement, that you keep people dancing? Well, I think some of our guests wore out the soles of their shoes. You helped us put on the best wedding ever! We have friends getting married in October in Norcross. They’ve hired a DJ (ugh), but she is looking for an organ player for the ceremony. I’ve given her your name and web page. I hope you can help her out. Blue Sky Band – Reception held on Saturday June 29, 2002 at Studio Two in Atlanta, Ga. Thank you so, so much for the wonderful job you and your band did for our wedding at Flint Hill on March 3rd 2002. We loved the music and heard many compliments from our guests. You took so much pressure off of us, so we could enjoy our special day. You are appreciated! ” …We just wanted to say thanks to BLUE SKY for making our wedding day such a wonderful and memorable event for us. We will sing of BLUE SKY’S praises to everyone we know to be tying the knot…” Kim and Martin Neary – Married at Bona Allen Mansion October 2, 1999. We just wanted to extend out appreciation for your participation in this year’s California Hardware event at the Carter Center on February 9, 2002 in Atlanta. Your total professionalism and cooperation form the set list, to your early arrival and having to switch the location of the setup of your band prior to to the reception’s start was very helpful. Not to mention your music, which was top notch. Again, we thank you, and not only will we recommend you but hope that an opportunity may arise in the future for us to work together again. Respectfuly Yours, Earl Bender – Avenel Associates – Washington, D.C.
Dear Jim: I want to thank you and your great band, Blue Sky. In the seven years Tom Egan and I have been involved with this event, we think your band was the best and most versatile we’ve ever had. When you find a great band you don’t want to let them go! We will pass your name along to the many attendees who asked about how to reach you. Thanks for throwing in that Irish music! “… You set the mood, you set the pace, you and your band provided the atmosphere that allowed our customers to be very close with us and build that trust further. I would recommend you to any corporation for social functions of this caliber. This could only be accomplished by truly talented individuals like yourselves… ” Peter Bulla Vice President of Laborie Medical – Blue Sky Jazz Quartet – 103 West – May 1, 2000.